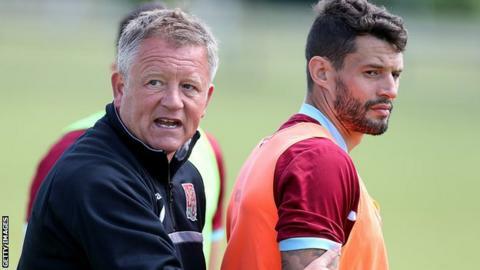 Northampton Town striker Marc Richards says he is "without doubt a better player now" than when he played for the Cobblers between 2003 and 2005. Richards scored 12 in 66 games in his first spell but has already netted 13 times since re-joining in the summer. "I was a bit raw (before). I probably ran around a lot and didn't look pretty on the eye," said the 32-year-old. "I seem to have hit the ground running this time and I'm delighted to be scoring as many as I am." He continued to BBC Radio Northampton: "That comes down to the creative players we've got in the team." Richards is League Two's top scorer, despite also spent time on the sidelines because of hamstring injuries. But his team have struggled for consistency, rising to fifth in the table in October but dropping back to 20th until recent points won against Southend and Exeter. "Hopefully we're back on track now and I think the new lads have given us a spark," said Richards. "Defensively, we've not been too clever, but I think we've tightened that up and with the players we've got, we're always going to create chances." Manager Chris Wilder added he has been pleased with the former Barnsley, Port Vale and Chesterfield striker since bringing him back to the club. "I was really impressed with his attitude as soon as he walked through the door," said Wilder. "He wants to win and he wants do everything right in training. His performances on the pitch have been outstanding. "We have to keep him fit - we lost him for a big period - and maybe it took one or two games for him to get back in the swing of it. "He really is now. He's a big player for us."